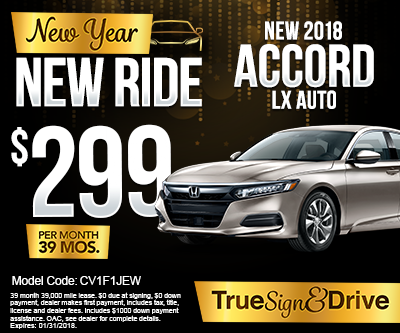 Looking for Honda Accord Lease Specials in the Minneapolis, St. Paul, Burnsville, Twin Cities & Inver Grove Heights, MN area? 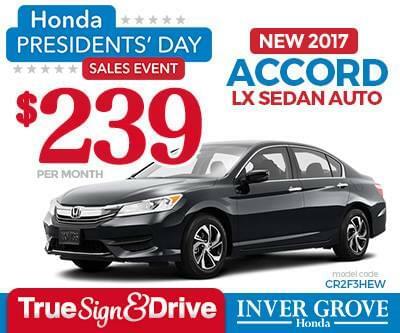 Browse our Honda Accord specials at Inver Grove Honda where you will find the New 2017 and 2018 Honda Accord Sedan, Coupe or Accord Hybrid you are looking for. *2017 Honda Accord LX Automatic. 36 month 36,000 mile lease. $0 due at signing, $0 down payment, dealer makes first payment, includes taxes, title, license and dealer fees. See dealer for complete details. *2017 Honda Accord Sport Automatic. 36 month 36,000 mile lease. $0 due at signing, $0 down payment, dealer makes first payment, includes taxes, title, license and dealer fees. See dealer for complete details. 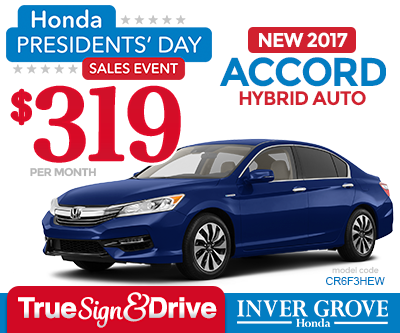 *2017 Honda Accord Hybrid Automatic. 36 month 36,000 mile lease. $0 due at signing, $0 down payment, dealer makes first payment, includes taxes, title, license and dealer fees. See dealer for complete details.